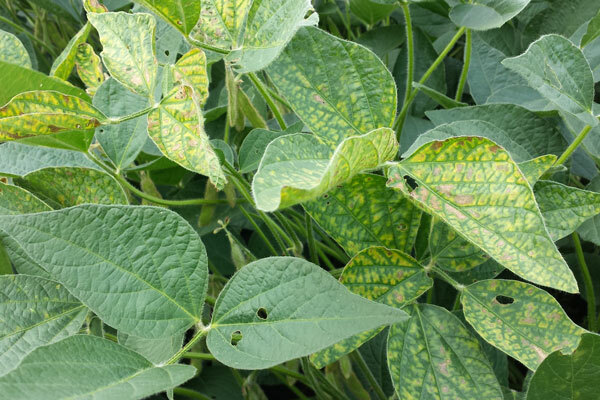 As soybean planting approaches, it is important to make early season management decisions to reduce losses from the two most damaging soybean diseases: sudden death syndrome (SDS) and soybean cyst nematode (SCN). 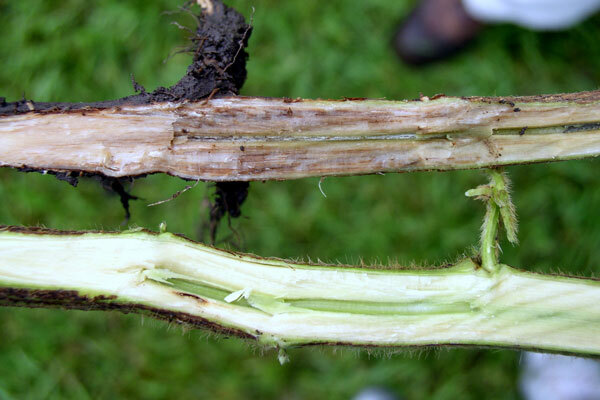 The pathogens of both diseases can infect soybean roots shortly after germination, making early season management of these diseases critical. (figure 1) Foliar symptoms of SDS. Note the interveinal chlorosis (yellowing) and necrosis (tissue death). 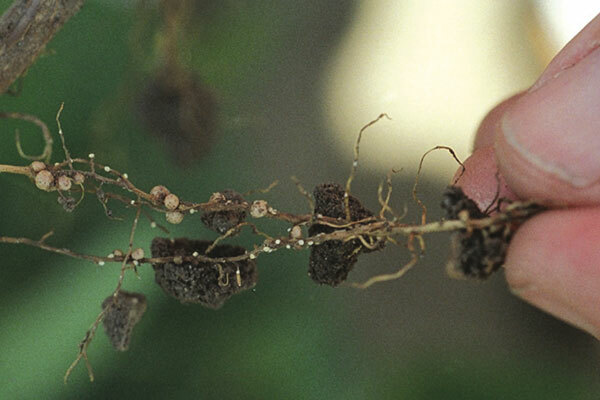 SDS is caused by the soil inhabiting fungus Fusarium virguliforme, survives on soybean residues and produces survival structures which can withstand the elements for several years. Its name is derived from the "sudden" appearance of foliar symptoms that occur after the plants begin to flower. Symptoms of SDS begin as interveinal chlorosis (yellowing) and necrosis (tissue death) of the leaves (Figure 1) and can eventually result in defoliation if infection is severe. Though the first observable symptoms of the disease are in the leaves, the pathogen is localized in the roots. For this reason, foliar fungicides are not effective in controlling the pathogen. When the lower stems and taproots of a soybean plant are split in half, affected plants will have a white to cream-colored pith (the center of the root) with a tan to brown discoloration of the cortical tissue (the tissue surrounding the pith) whereas the cortical tissue of a healthy plant will remain white (Figure 2). Root infection by F. virguliforme can begin as soon as roots have emerged from the seed and is favored by cool, wet soils. For this reason, management of SDS begins at planting. Methods of managing SDS once it is present include: delaying planting until soils have warmed (> 60°F), improving soil drainage, reducing compaction, selecting SDS resistant varieties, and crop rotation. Fusarium virguliforme also is capable of surviving and increasing on corn residues, so the traditional corn-soybean rotation may not be sufficient to substantially reduce the amount of fungal inoculum (disease-causing particles) in the soil. Breaking up this traditional rotation with a small grain or other non-host crop can help decrease inoculum levels. Most commercially available seed treatment fungicides are ineffective in controlling F. virguliforme, but fluopyram (Ilevo; Bayer Crop Science) has been shown to have some efficacy in reducing infection severity. Most importantly, if SDS is confirmed in a field, avoid continuous soybean production to reduce the buildup of fungal inoculum in the soil. Soybean cyst nematode, a plant-parasitic roundworm, is another soil-inhabiting pest found throughout the soybean growing regions of the United States and is well established in Missouri. SCN juveniles penetrate the root tissue and establish feeding sites, called syncytia, which then reduce water and nutrient uptake in the plant and ultimately result in yield reductions. In Missouri, SCN is capable of reproducing on soybean roots at a rate of three to six generations per year (Figure 3). When symptoms of SCN damage are visible, plants appear stunted and yellowed or result in bare patches in the field. Frequently, symptoms of SCN damage are not visible, but there still can be up to 30% yield loss. Additionally, the presence of SCN in conjunction with the SDS pathogen in a field can increase the severity of SDS foliar symptoms. The first step in an active SCN management program is to sample the soil in fields where soybeans are grown and to get your SCN egg count (each egg is a potential disease-causing unit). Remember: take the test, beat the pest. To sample for SCN, subdivide large fields into 20 acre sections, collect at least 15-20 soil cores from each section, and thoroughly mix the cores from within each section together. Collected samples can be submitted to the University of Missouri SCN Diagnostic Lab with a completed nematode sample submission form indicating that an SCN egg count is needed. Sampling for SCN can occur at any point during the growing season, but SCN counts are most informative when soil is collected at or shortly following harvest or just prior to planting. Additional information on how to soil sample and how to submit samples to the SCN Diagnostic Lab can be found on their webpage (scndiagnostics.com). Management of SCN relies on the use of resistant varieties and crop rotation to non-host crops. The primary source of resistance in commercially available soybean varieties is derived from a single source, PI 88788, which has resulted in many SCN field populations adapting to SCN resistant varieties in Missouri. The most effective way to manage SCN still begins by selecting an SCN resistant variety, but it is important to rotate the varieties planted each year. By rotating varieties, even if those varieties have the same source of resistance, the ability of the pest to adapt to PI 88788 can be slowed. 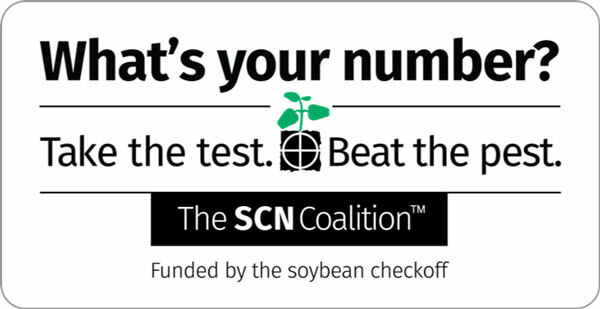 The key to keeping SCN numbers low is to test your soils and manage your populations while the numbers are low. When egg counts are high, yearly testing, crop rotation to non-hosts, and rotation of SCN resistant varieties can be employed over multiple seasons to reduce the SCN population density. In some cases, nematode-protectant seed treatments could be an additional management option. If possible, avoid growing continuous soybeans in heavily infested fields. Additional information on active SCN management can be found on the SCN Coalition website (thescncoalition.com) and on the MU Extension website (extension2.missouri.edu/G4450).